The founder of our law office, Stephanie Vaught Little, is a native of Horry County and is deeply committed to helping its people. She has previous experience as a prosecuting attorney, as a judicial clerk, and as senior editor of The Law Review for the Appalachian School of Law. Ms. Vaught Little has earned the National Association of Women Lawyers Award as well as the Willard Owen Award for Excellence in Community Service. She is a volunteer with the Horry County Drug Court and South Carolina Bar Middle and High School Mock Trial Competition and sits on the Board of Trustees for the North Myrtle Beach Human Society. Regardless of the type of matter that brings people to our firm, we take the time to listen to concerns and deliver tailored legal guidance. For clients' convenience, we take credit cards as an accepted form of payment. 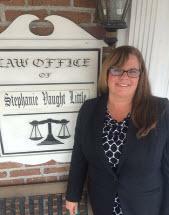 The Law Office of Stephanie Vaught Little, PC works with people across the greater Myrtle Beach metropolitan area.